This blog is a bit longer then anything I've written recently. Be prepared to read around 1000 words. Tldr; Report stuff, for the good of PMC. I've come here to tell you about something that's very important here on PMC, reporting, or as some people call it, grabbing flags. What's so important about reporting you ask? Simply put, it allows us to get rid of all those re-colored skins, copied mods, and those pesky server advertisements in the blogging section. It gives us the ability to help Planet Minecraft as a whole. Who wouldn't want to do that? (I'm looking at you, people who make such things as listed above)! 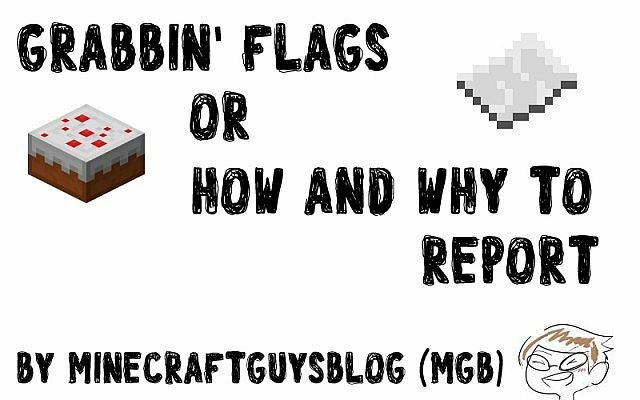 But first, I'm sure some of you may be asking, "What is reporting MGB? What are these flags I must grab?" This is actually an easy question to answer. For the few of you who don't even know how to report, it's very simple. In every submission on Planet Minecraft, you will see a little box that has four items in it. It contains the number of views, the number of comments, the Favorite heart thingy, and then a box that says "Flag/Report Submission" which also has a little grayed out flag. Want to report a submission? (Don't even THINK about reporting if it doesn't break the site rules or the submission guidelines) Click on that little grayed out flag, and this box will come up! Yay! It is in this box that you do your reporting. Select what category it fits into and explain why it should be removed. (For more info on putting together a report, I'd recommend this blog by Charlizard). Also, a quick note by request of a Site mod. There is a very important concept that has to do with reporting called "Grandfathering." More and more people are reporting older submissions that technically break the rules. However, these submissions were created before the rule that they break was enacted. Therefore, they don't break the rules. Pay attention to these kinds of things before reporting. A suggestion is, if you're going to go on a reporting spree, do NOT do it from search. Look page by page through submissions. Then, you don't even have to worry about Grandfathering. Ok, so now you (hopefully) know how to report. So what? What's the purpose of reporting? There are three that I can see. More and more often, as I'm stumbling around the blog section, or any other section of the site for that matter, what I see is about 50% rule breaking submissions. Spam, re-colorings, the like. So what would happen if everybody stepped up on reporting and helped get rid of those submissions? More exposure for all the non-rule breaking people (hopefully, this includes you). Therefore, report a rule breaking submission, it gets removed, and that's more exposure for everybody else! More exposure for hard working people is good, right? It's a win-win, considering how you yourself can get more! Simply put, rule breaking submissions don't belong on PMC. They clog up space and could possibly lead other people to think that rule breaking submissions are OK. For example, let's pretend I'm a new member, who hasn't read the rules (or perhaps I don't care about the rules) and I have a server that I want to get the word out about. Let's say I'm glancing through the blog section, and I see another person advertising their server. Now, if I hadn't read the rules or if I simply didn't care about them, what would I do? 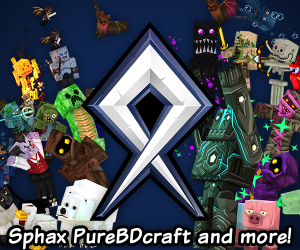 Type up a quick blog about why you should join my server! What can help mitigate these kinds of scenarios from happening? Reporting! Reporting a rule breaking submission will (hopefully) lead to deletion, minimizing the time these offending posts can influence others! It's yet another great benefit from reporting. Being the guy I am, I am obviously going to bring up the current state of the PMC Blogging section in a blog about reporting. (Well, it's a blog, so I guess it's justifiable). Well, rather, I'm going to use it as an example. Anybody who knows their way around Planet Minecraft and who has been here for a while will tell you within 5 seconds that the blog section is a mess. And it really is. The spam to non-rule breaking content is at least 2/1. Then content that actually obeys the rules compared to content that's worth reading... eh, thato s not really related to my point. However, how did the blog section get to be where it is today? Nobody cared. Or, too few people cared. Nobody took the time to report. Nobody took the time to specifically look through the blog section, trying to find rule breaking things. Nobody took the time to take out the trash. Rise in spam levels (partially as a result of the lack of reporting) drove out the popular, good bloggers of the day. As a direct result of THAT, the blog section fell to ruin within a EXTREMLY short period of time as nobody stepped up to take their place. Now, I'm not saying that if you don't report every copied mod or virus-laden texture pack you come across your favorite section will become as barren as the Blog section. We all know that Disco_ or KnobleKnives PROBABLY will not give up because of a little spam. However, if you don't pay attention, it very well might happen. Report everything you see, for the good of your favorite section. There you have it guys. You (hopefully) know a bit more about how to report and you have three reasons why I think you guys should report. However, please do not hesitate to add to, subtract from, or criticize what I have said. That's what the comment section is for! Great blog! But why are there "o"s everywhere? Diamond. I wish they were more strict about better default packs before I put 1000 hours into mine. It took me a few seconds to report before. Now it takes me a few hours. Nah, let`s go back to old style. This blog. I like this blog. This is a good blog. It would be a nice gesture if you removed all the rule-breaking submissions before one of them does. You can feel free to contact any of us with a question of "Is this allowed?"